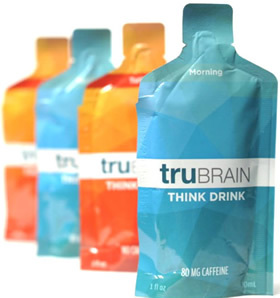 TruBrain is labeled as a Think Drink because it is designed to promote mental clarity, stamina, and productivity. It seeks to achieve this with a blend of either 8 or 9 ingredients known for their brain enhancing properties. TruBrain was developed by Dr. Andrew Hill and Dr. Aida Attar of UCLA. TruBrain Think Drink consists of 3 distinct sachets. For best results consumers are advised to take TruBrain daily as directed for at least 15 days to a month, which is why this product is sold in a 30 day supply. We were recently sent a day's supply by the company and here's what we thought. The Morning and Afternoon shots have the same flavor, which is a very sweet/syrupy fruit flavor with a tart finish. The Morning shot was a tad bitter from the caffeine. The Turbo shot is equally as sweet but has a different fruit profile and isn't tart. Overall, all three shots were easy to drink. The only energy ingredients in TruBrain are the caffeine and sugar. The Morning shot is similar in effect to a 250ml Red Bull or a shot of espresso. The following ingredients are designed to enhance the brain's function over time when taken regularly. Each shot also provides 1000 mg of Vitamin C.
We are unable to evaluate the full effect of TruBrain since we only tried a day's supply and not the full 30 day supply that's recommended. TruBrain is intended for Healthy Adults only. Sugar content: 9 grams (per 1 ounces). How Does TruBrain Morning Compare? TruBrain Morning contains 80.00 mgs of caffeine per fluid ounce (270.51mg/100 ml).